A win at the Shomos and some September resolutions! Yesterday the 3rd Shomo Conference and Award ceremony took place in London and I won an award! Woo hoo – thanks judges. I also won a bottle of champagne in a lucky draw. It was obviously my lucky day! I didn’t go to the conference expecting to win anything (although it was a definite bonus). I went because I wanted to meet up with other money minded bloggers and to learn stuff. Andy Webb, the guy who runs the Shomo’s has done an amazing job of building a community of money bloggers and of running a brilliant conference and awards ceremony. Andy doesn’t do it alone, there are lots of people helping him including his wife and various money bloggers and I want to say thank you to all of them for all the hard work they put into it! During the day I went to two break out sessions. One was about self publishing and the other was about running online courses. Thank you for all the great tips Di Coke of Super Lucky and Emma Drew of EmmaDrew.info in your sessions. The problem is that I don’t feel like I am actually getting anywhere with anything. It’s pretty obvious to me and I’m guessing glaringly obvious to you, that I need to stick with one thing, get it done and then move on to the next thing. My problem is that I have been torn between which thing I should start with and where I should focus my time. During the Shomo conference there was a discussion about saving and investing and the theoretical question was asked – would you prefer £50 now or £55 in a years time? Most people would prefer that £50 now and prioritise the present over the future. If you took the £55 in a years time though that would actually be a really good deal because it would include 10% interest on the £50 which under current interest rates it is unlikely you would be able to get anywhere else. It kind of hit me that, I have also been focusing on the present more than the future . I’ve been thinking about what will have the biggest impact now and then jumping on the next bandwagon that I think will make that happen. Each and every time I have realised that actually none of the ideas I have had will turn into successes over night. They all need time and effort put into them with the results being far off into the future. So if I want to have any hope of success I need to work on something now for future and not present gain. On a slightly different note, I turned up to the conference with my reusable coffee cup (although I only drink herbal teas, but calling it a herbal tea cup doesn’t quite work for some reason :)) and topped it up all day with hot drinks. It was a real talking point and various people noticed it, asked about it and wondered why they hadn’t brought their own one with – which I thought was great. Especially as it hadn’t even occurred to me not to take it and I wasn’t particularly trying to make a statement :). Even more excitingly Andy’s wife asked me if next year they could consult with me about how to reduce waste at the event next year, which is brilliant and I am really looking forward to doing. If you have any tips and ideas for reducing waste at events that you think would be helpful please let me know! I think September is a good month for goal setting because it feels like a new beginning and my resolution is that by next September I will have written the book and developed the course and maybe even done some of the other things I would like to do. I will do one thing at a time though and will work on it to the exclusion of all other projects until it is done (or at least I will try my best). I really want to be able to say by the next Zero Waste Week and Shomos that I have done these things, so wish me luck! Thanks! Is there anything you want to get done by next September? Tell me about it in the comments below! 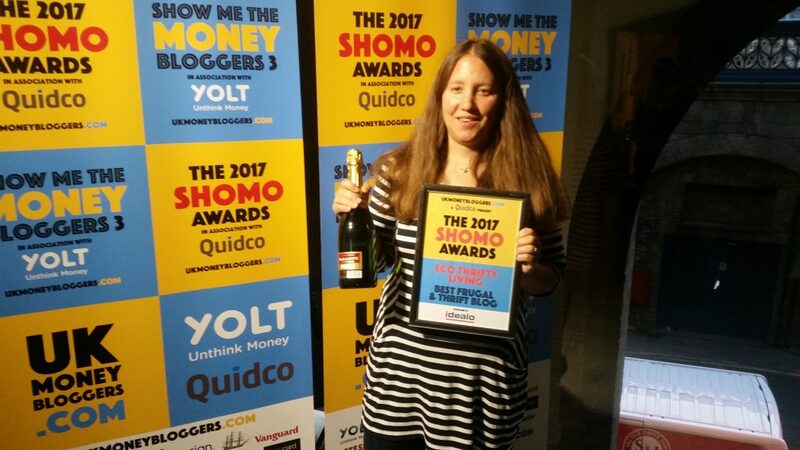 This entry was tagged #shomos, blog awards, shomos 2017, UK Money Bloggers. Bookmark the permalink. ← Are you ready to kick start your journey to less waste? Oh that’s such a great idea. I need to start remembering my reusable cup, I always take it to work but never remember other places. By next September I’ll hopefully be a mature student and so I need to take steps to save money as I’m not going to be working much! I’m going to restart a money diaries on my blog because Saturday taught me that I am trying to save and I’m spending silly amounts and almost hiding it. Sounds like you have been really rather busy in all fairness so don’t be too down on yourself! Noticed the blog is looking rather different since I last visited as well, looks amazing so well done on that too. I agree on trying to focus on one thing at a time but also am totally useless at doing that and usually find myself spread thinly over many different ideas/projects. The ideas part and beginning is always most fun as there are endless possibilities and none of the boring stuff going on which is actually needed to turn something into a real success… proof reading a book or doing the accounts for your online art shop, for example. I wish I would give you a silver bullet bit of advice but will just say something really cliched like stick at it as best you can and sure you will end up looking back next year and having seen you’ve done loads of stuff! Thanks – you should come to the Money Bloggers conference next year. You are right it is definitely easier and more fun coming up with ideas than seeing them through!